Franny McGrath, operations manager at Perth YMCA, joined the Members on Tuesday, as the guest of Chris Kirk, to receive a donation of £1000 from the Club. 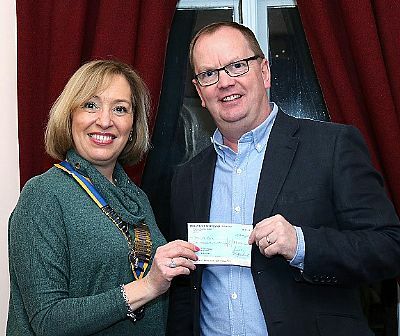 The cheque was presented by President Gillian Marsh. Franny thanked the Club for the donation and explained that the money will be going towards a large project of YMCA members. The project will be based abroad in Africa and allows ten youngsters to experience the support network for other people in remote locations. Work will involve them in progressing further skills for themselves and others.